Lot of comments were floating around that the method described in our post How to use Amazon Appstore Outside US is not working anymore. So in response to all those comments here is a Quicktip from team Abtevrythng to make you get that free app from Amazon Appstore. Lot of people reported that the method described in our previous post used to work for them earlier but stopped to working for some reason. So this post is dedicated to all those who are facing similar issues and getting the most famous error from Amazon Appstore which says "Not available in your region". STEP 1: If you already have an Appstore ID which you were using to download apps previously jump to Step #2. If you are a new user and using Appstore for the first time, please follow the steps in our earlier post and if you get any error than come here and check out the next steps. 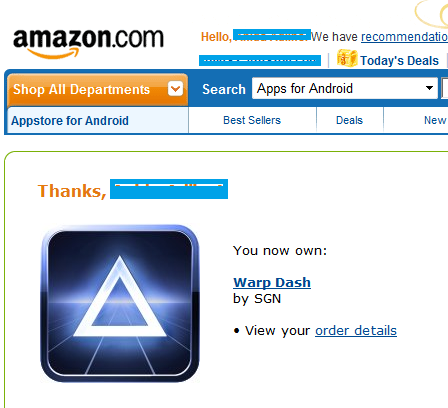 STEP 2: To make it work again, all you have to do is use Amazon Appstore on your PC/Mac to get the app. To do this simply open Amazon Appstore website on your PC/Mac using any US VPN and login with your credentials. Windows PC and Apple Mac users - Follow the steps mentioned on our latest post Free VPN Client for PC and Mac. We recommend using a free solution discussed in our earlier post Free VPN Service and Client for Windows Gmail Call features outside US. STEP 3: On the Amazon Appstore page itself you will see 'Get App' button for the Free App of the day. Just go ahead and click that. STEP 4: As soon as you hit Get App button, The page gets refreshed and shows you a message saying 'Thanks, you now own the blah blah App and see you order details'. Congratulations you just got the app. STEP 5: Now onto your mobile Open Appstore, press Menu and go to My Apps. You will now see the 'Free App of the Day' in Apps to Downlaod and Install list. 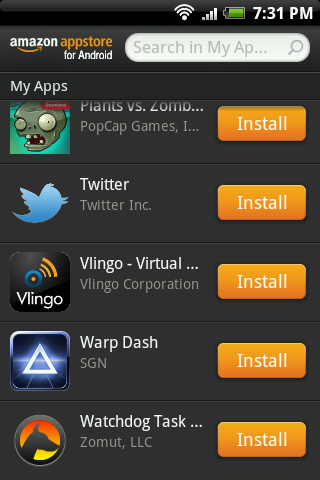 Now just tap 'Install' to download and install the app on you Android. Remember that we do not recommend using US proxies, instead use a VPN service. One more such free US VPN service is described in our posts Gmail Call Features Outside US without Administrator Rights. Say thanks by liking us on Facebook if this works for you. That way you will always be aware of latest tips tricks and tweaks plus you will get 'Free app of the Day' notifications right in Facebook!